Design Thinking and Social Entrepreneurship Hackathon for South L.A.
Members of a community are too often relegated to being mere spectators of change. How can they instead become active participants and influencers in the changes that affect them most? In this third annual design hackathon event, participants used design thinking and UX methods in an entrepreneurial spirit to address social, economic, and environmental challenges specific to South LA Participants first learned about these challenges with two kick-off talks: Julian Scaff, organizer of the event and Design Director at the agency Interactivism, talked about economic and environmental challenges facing South LA, focusing particularly on the complex issue of gentrification. Zaneta Smith, director of TEDx Crenshaw and an expert in social work, talked about the socio-economic issues facing local residents, young people, and homeless population. Then participants formed teams to brainstorm and rapidly prototype solutions. At the end of the day all the teams pitched their projects, and a winner was decided by democratic vote. Eventually all the projects will be featured on the TEDx Crenshaw website so that they can be exposed to city officials and private investors to inspire real solutions in the local community. The winning idea was a smartphone app called “Open Door” designed by Jessica Rahman, Sapphira Dai and Kiki Lowry. Lunch, prizes and space for the event were provided by General Assembly. Below is a description of their project with screens of what the app would look like. There are 44,000 people in Los Angeles County that are homeless. Of these, only 16-20% of adults are employed. There currently is no easy-to-navigate tool for this population to find job and housing opportunities in LA, despite existing resources. Open Door is a mobile application connecting persons who are homeless and/or formerly incarcerated with employers and home listers, including social enterprises, who empathize with the aforementioned populations. Job search and apply for job screens. On left: Confirmation screen. On right: Zaneta Smith, Jessica Rahman, Sapphira Dai, Kiki Lowry, and Julian Scaff. Special thanks to Miki Reynolds, Kellie Cockrell and Auriel Jimenez at General Assembly for their invaluable help in making this event possible. This entry was posted in Design, Design for Good, Education on March 28, 2017 by Editor. The following is the original text from my talk at TEDx Crenshaw that took place in Los Angeles on Saturday, October 24, 2015. The video of the talk is included below. Special thanks to my editor Crystal Clayter for helping me write this piece and prepare for the talk. I want to share with you a couple of things about my way of thinking. I have always viewed the world as one large interconnected system, and I’ve always wanted to use that understanding to make a real difference. John Muir once said “When we try to pick out anything by itself, we find it hitched to everything else in the Universe” and Ice Cube once said “The worst thing you can do about a situation is nothing.” And you know what’s really cool? I think I might be the first TEDx speaker in history to quote John Muir and Ice Cube in the same sentence! So now that we’ve gotten that milestone out of the way, I want to tell you about something happening right here in South L.A. that illustrates these two ideas. A few months ago I heard a story on NPR news about a project called “Green Alleys” in the neighborhood surrounding Avalon and 52nd Street. Alleys are important for pedestrian traffic in this neighborhood, but they’re ugly, full of trash, and unsafe. When it rains, they flood with water and people can’t use them. The Green Alleys Project is addressing all of these problems with a unified solution. Solar recharging lights are going to allow people to safely use the alleys at night. A new type of pavement will let water seep into the ground, preventing floods and naturally filtering out pollution. Drought tolerant plants will beautify the alleys and help control dust, and public art projects will foster appreciation of culture. Promoting safe use of the alleys helps people get to and from work, helps kids move between school and home, and is good for both the environment and economy. This project is important because it doesn’t treat all of these problems as separate issues. It recognizes that they’re all connected. We can’t effectively deal with one problem without addressing all of them. I believe that the challenges we face in our community, and the world, are so big and complex, that we can’t fix them without a holistic approach. I present to you a solution that has the power to bring about vast changes: something called Design Thinking. Design Thinking is a collaborative method for problem-solving. You start by identifying the problem. You come up with and test many divergent ideas on how to address all facets of the problem. You bring together the ideas that work, and discard the ones that don’t. You repeat these steps, as necessary, refining your ideas on each go around. And finally, you execute a solution. Empathy. That’s why it’s often called human-centered design. Collaboration. You don’t have to be a designer to take part, and diverse viewpoints are highly valuable. Empowerment. Design thinking is about enabling people to become active participants in their own destiny. Design is not just the domain of the creative class sealed in their little bubble. I teach user experience design at a postgraduate college called General Assembly, and I believe that teaching people design is teaching people empowerment. My students come from a vast range of backgrounds, and I really believe that anyone can take part in design. We cannot predict the future, but together we can invent it. In service of this idea, I recently organized a Design Hackathon at General Assembly in South LA. With teams of students and alumni from General Assembly and USC, we spent a day applying design thinking to the challenges facing our local community. The teams came up with amazing, inspirational ideas. Unfortunately I don’t have time to share all of them with you today, but I want to show you a couple of them so it’s clear what people can do in just a matter of hours, working together and using Design Thinking. This is a smart phone app called “Urban Green”. As many of you know, South LA has over 3,000 empty lots, many of them used for nothing more than dumping trash. An organization called LA Open Acres has mapped all these sites, but the Urban Green App goes further. Using geolocation on your phone, you can see all the empty lots in your vicinity, who owns them and if they’re available to be reclaimed. You can also connect with others in your community to organize and work together. This app empowers people to turn trash dumps into parks, playgrounds, and public gardens, with positive impacts for the local economy, culture, public safety, and the environment. Here is another smart phone app called “100 & Rising”. One of the challenges of local business is how to draw investments, in order to grow and withstand the pressures of gentrification. This app is designed to empower local minority-owned businesses to seek micro-investment from the community. It also helps local entrepreneurs to raise funds for starting new businesses. The benefits include sustainable job growth, community pride, and profits from locally-owned businesses stay in the community, rather than being exported to another state or off shore bank account. 100 & Rising allows local minority-owned businesses and entrepreneurs to be participants rather than spectators in the economy. Earlier this year, in Ohio, an educator ran an experiment called Prototype Design Camp with students from both public and private high schools. In the camp the high schoolers were taught methods of design thinking, organized into teams, and then allowed to work on projects. Now, you’d probably expect high schoolers to be interested in designing new smart phone games or meme generators. But that’s not what they did. Instead, they designed new schools with better learning environments. They designed better classrooms. And they designed new ways to build social movements. In other words, they wanted to think BIG. Just by teaching a new approach to thinking about and solving problems, high schoolers were more engaged, more proactive in their learning process, and they were thinking in systems. This potential exists in the young people in this community as well. It’s time we harness it. The challenges facing our community and the world are big, complex, interconnected, and urgent. We need a new way of thinking to meet these challenges. We need to be teaching design thinking to young people, at least at the high school level, if not earlier. Now is the time to design our own future. This entry was posted in Design, Design for Good, Education on December 30, 2015 by Editor. SOLA/HACK was a design hackathon I organized, hosted by General Assembly’s downtown L.A. campus. Participants included current students and alumni from General Assembly and USC. The objective of the hackathon was to apply design thinking and UX design principles to issues specific to the South L.A. community, with an eye toward how appropriate uses of technology could be used to help address social, economic, and environmental problems. While technology can be a powerful tool for change (think of the crucial role of cell phones during the Arab Spring uprising) it was stressed that there is not an easy techno-fix to every social problem. So participants were encouraged to look beyond just apps or websites and employ systems-based thinking on their solutions. The area is a food desert, with half the number of grocery stores as other parts of the city. It has the worst pollution levels in L.A. county. South L.A. has an 8.4% unemployment rate, compared to 7.6% for the rest of the city, and per capita income is half of what it is for the rest of the city. South L.A. is starting to gentrify, which will push out lower income residents. Risk factors for gentrification in the area include a a high proportion of renters, access to transportation via major freeways and expansion of public transit affords easy access to job centers, and housing values are low while architectural merit is high. Further, the affluent neighborhoods in L.A. have skyrocketing real estate prices for both buyers and renters, and in some cases are depopulating due to restrictive zoning laws. Recent studies have identified this as the real engine behind gentrification. Zaneta Smith, a social worker and community leader in South L.A. who is also the organizer of the TEDxCrenshaw event, was a guest speaker and mentor for the hackathon. She opened the hackathon with invaluable information on the myriad challenges facing the local community, and mentored the teams on their projects. Zaneta Smith talks with participants at SOLA/HACK. Sofia Khan, a UX designer with Iteration Group and instructor at General Assembly, provided invaluable support and mentorship to the participants. Sofia and General Assembly alumn Alan Ortiz also taught a workshop on rapid prototyping, a critical tool for UX designers to empirically test ideas. Participants were encouraged to think outside the box, think in systems, and draw connections between seemingly disparate ideas. The primary objective is innovation through collective brainstorming and rapid prototyping. At the conclusion of the hackathon, the participants voted on a winner. The vote was very close as all of the proposals were extremely strong and innovative. But in the end an app called Urban Green took the top prize. Below is a synopsis of this app, followed by the proposals from the other teams. Winner: Urban Green by Karen Murphy, Bryan James, Natalie Sacks, and Kelsey Klemme. 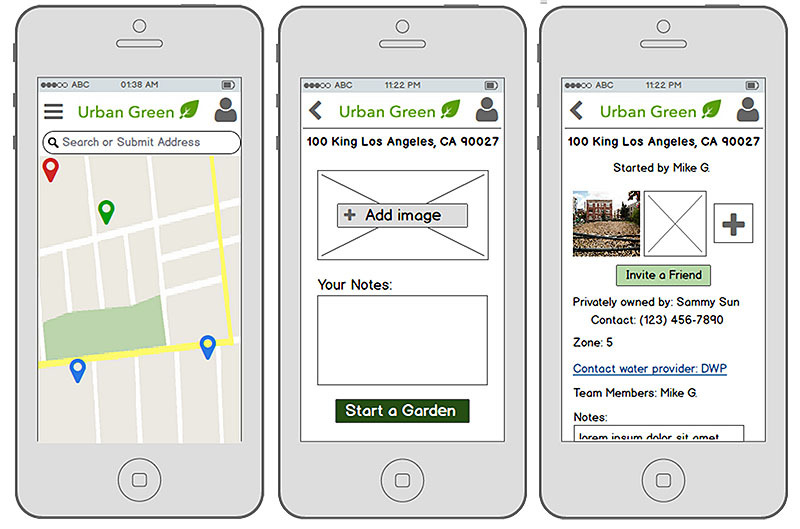 “Urban Green” is a smart phone app that addresses the issue of empty lots in South LA— over 3,000, many of which are used for nothing more than dumping trash. An organization called LA Open Acres has mapped all these sites, but the Urban Green App goes further. Using geolocation on your phone, you can see all the empty lots in your vicinity, who owns them and if they’re available to be reclaimed. You can also connect with others in your community to organize and work together. This app empowers people to turn trash dumps into parks, playgrounds, and public gardens, with positive impacts for the local economy, culture, public safety, and the environment. 100 & Rising by Rachel McLeod, Leon Baham, and Evangeline Hsiao. 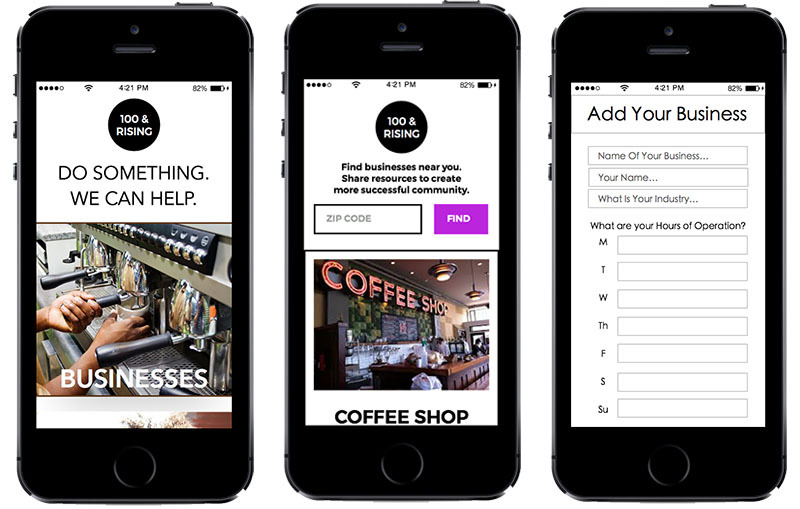 “100 & Rising” is a smart phone app designed to empower minority-owned businesses and entrepreneurs. One of the challenges of local business is how to draw investments, in order to grow, expand capacity and withstand the pressures of gentrification. 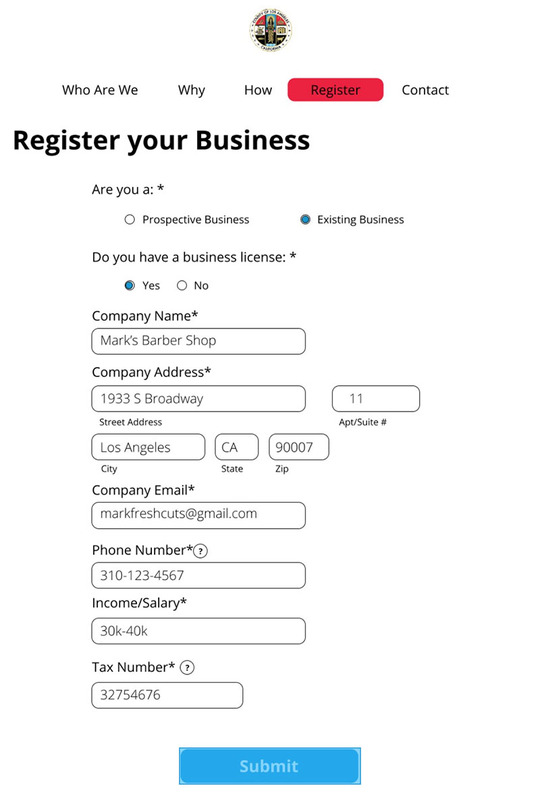 This app provides a tool for local minority-owned businesses to seek micro-investment from the community. It also helps local entrepreneurs to raise funds for starting new businesses. The benefits include sustainable job growth, community pride, and profits from locally-owned businesses stay in the community, rather than being exported to another state or off shore bank account. 100 & Rising empowers local minority-owned businesses and entrepreneurs to be participants rather than spectators in the economy. Help a Family Grow by Bianca Byfield, Viannka Lopez, Min Ryu, and Marvin Monserrat Jr.
“Help a Family Grow” takes an innovative approach to the challenge of foster care youth at the transitional age range of 16-24 known as “Transitional Age of Youth” or TAY. South L.A. has the highest number of foster care children in L.A. County, and many Transitional Age of Youth (TAY) do not have access to good schools, or good support and mentorship for transitioning to adulthood and independence. Help a Family Grow matches these youth at the ages of 18-24 with businesses who can provide not only on-the-job training but also housing, by utilizing existing state foster care subsidies. The program goes well beyond a website and app, helping to build relationships between youth and business owners. The subsidies allow businesses to increase staffing levels, and provides youth invaluable job skills and experience. This systems-based approach is built on a forward-thinking model of partnering county and state governments with local business in a solution that benefits all. 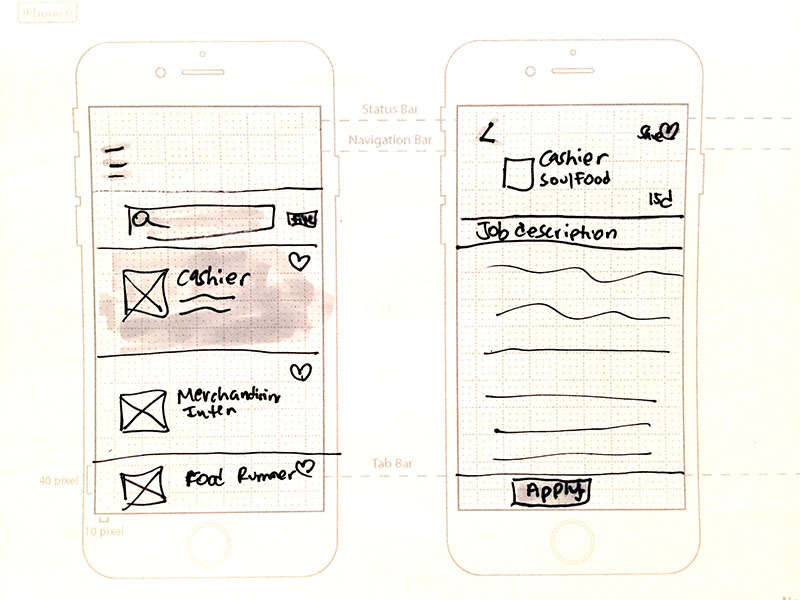 Concept sketches for the “Help a Family Grow” app design. Voice of South L.A. by Ellie Hoshizaki, Philipe Navarro, Kendrick Parks, and Poy Yeung. “Voice of South L.A.” is an app that gives people a voice to their representatives in government. People often feel powerless and far removed from their political representatives, and this powerlessness contributes to South L.A. having the lowest voter turnout and civic involvement in the county. 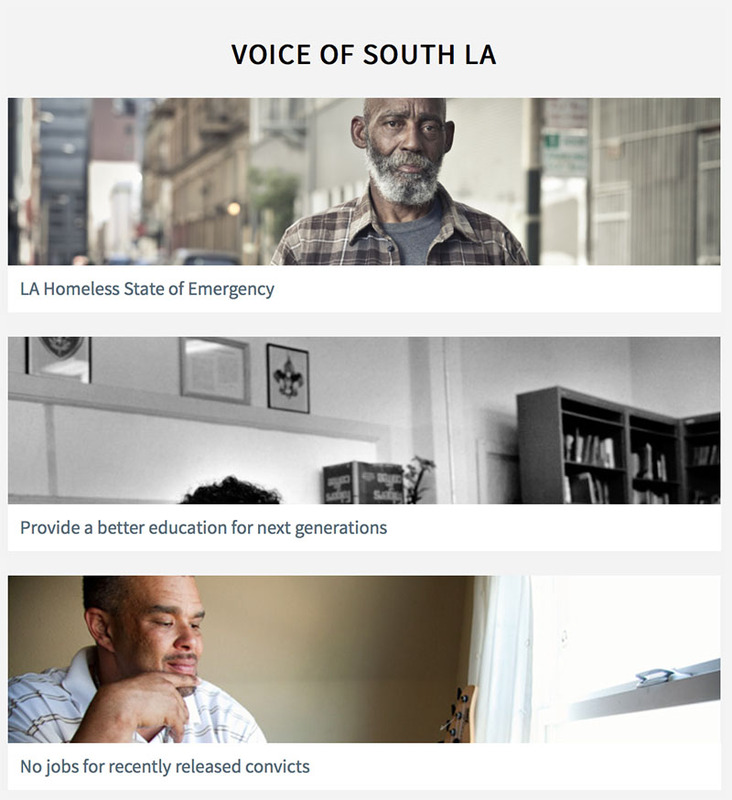 “Voice of South L.A.” provides pre-populated forms for sending messages directly to local government officials, and also allows you to share your message with others to organize and inspire. It is a tool that empowers any individual person to participate in the democratic process and hold their representatives accountable. Greater civic involvement has vast positive direct and indirect effects on a broad range of social and economic issues. SoLocal by Hassan Latif, Brooke Newberry, Tiffany Koh, and Melissa Jeffries. Small minority-owned businesses in South L.A. are feeling the early pressures of gentrification which include rising rental prices and shifting demographics. 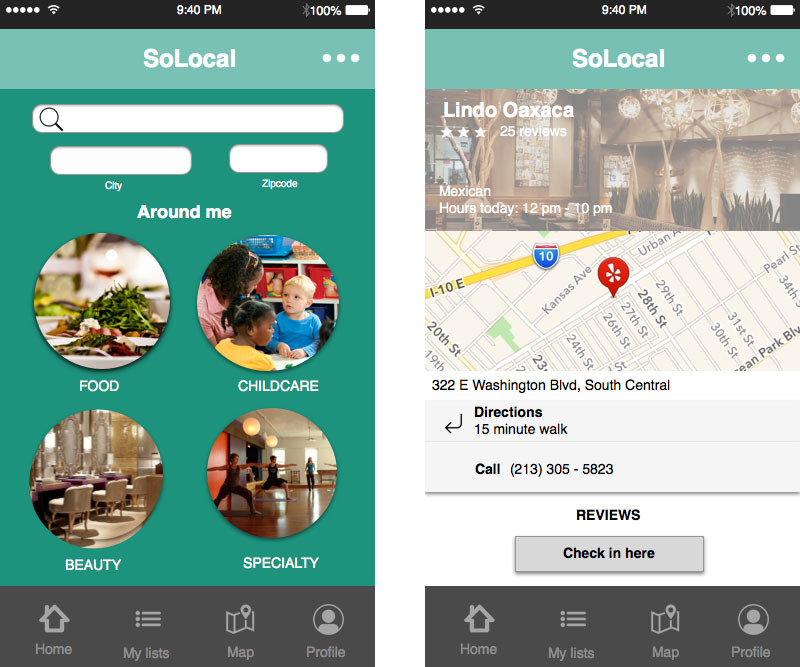 SoLocal is an app for consumers to find and support local minority-owned businesses using geolocation. Going even further than finding business, the app cross-lists items for sale and services in multiple businesses, allowing users to create shopping lists and do virtual window shopping by searching across different genres of retailers. Based on user’s shopping preferences the app would also make suggestions for stores that carry similar goods. SoLocal is a hub for creating a community that is both an online community and physical community for local minority-owned businesses and consumers. The problems facing the local community in South L.A. are complex, interconnected, and in many cases long-standing and deeply-rooted. Technology alone cannot solve these issues. What will work is a systems-based approach that recognizes that socieity, theeconomy, and the environment are part of an interconnected eco-system. The participants in SOLA/HACK demonstrated that by taking a systems-based approach and employing design thinking, innovative and forward-thinking solutions are in our grasp. 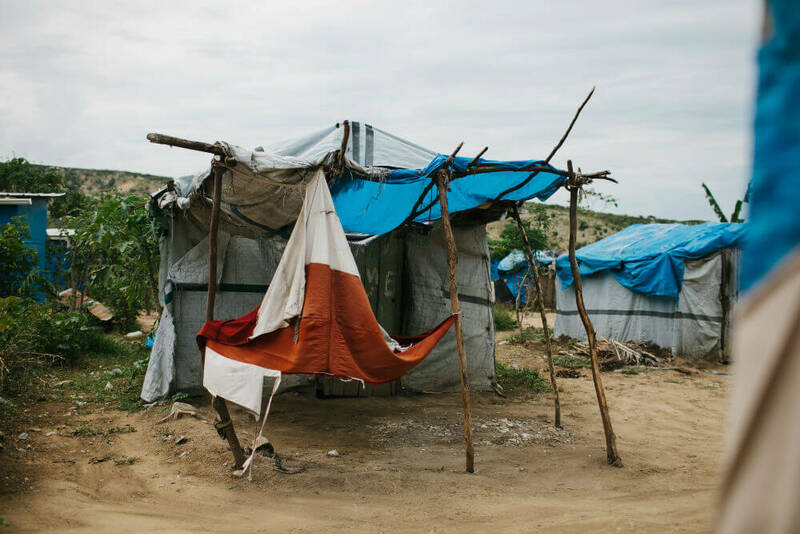 Indeed, the most innovative advances in UX design in the next decade will be in design for social good. I intend to use design thinking to be the change I want to see and to teach others to do the same. This entry was posted in Design, Design for Good, Education on October 27, 2015 by Editor.